The Sudanese Christian woman whose death sentence for apostasy was overturned but who was detained again this week is now at the US embassy for her own "safety". 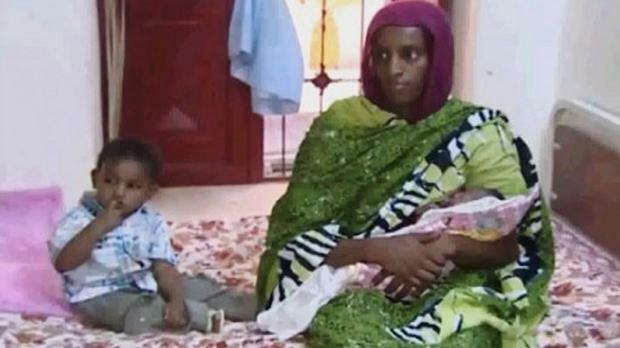 Meriam Ibrahim, 27, last night left a Khartoum police station, where she had been detained with her two children and husband on charges of forging travel documents. She headed to the embassy for fear of "assault" either by relatives or angry residents, according to her lawyer, ElShareef Ali Mohammed. A US official confirmed Ms Ibrahim is at the embassy and said diplomats are trying to arrange her departure from Sudan. Lawyers said she had been released after foreign diplomats pressed the Sudanese government to free her. Ms Ibrahim was sentenced to death over charges of apostasy. A daughter of a Muslim father, she was raised by her Christian mother. She married a Christian man, Daniel Wani, who holds American citizenship and is from South Sudan, in a church ceremony in 2011. Muslim women in Sudan are prohibited from marrying non-Muslims, though Muslim men can marry outside their faith. By law, children must follow their father's religion. Sudan's penal code forbids Muslims from converting to other religions, a crime punishable by death. The court in the capital, Khartoum, also ordered Ms Ibrahim be given 100 lashes for having sexual relations with her husband. The sentence drew international condemnation, with Amnesty International calling it "abhorrent". The US State Department said it was "deeply disturbed" by the sentence and called on the Sudanese government to respect religious freedoms. Amid an international outcry against the sentence, she was acquitted by Sudan's court of cassation and freed on Monday. But she was detained the following day with her family when they tried to leave Khartoum's airport en route to the United States with what authorities described as forged travel documents. On Wednesday, Sudan's foreign ministry said it summoned South Sudan diplomats to protest against the issuing of travel documents to Ms Ibrahim, who has Sudanese citizenship. Sudan introduced Islamic sharia laws in the early 1980s under the rule of autocrat Jaafar Nimeiri, a move that contributed to the resumption of an insurgency in the mostly animist and Christian south of Sudan. The south seceded in 2011 to become the world's newest nation, South Sudan. Mr Wani, Ms Ibrahim's husband, was granted US citizenship when he fled to the United States as a child to escape the civil war, but he later returned. A number of Sudanese have been convicted of apostasy in recent years, but they all escaped execution by recanting their new faith. Religious thinker and politician Mahmoud Mohammed Taha, a critic of Nimeiri and his interpretation of sharia, was sentenced to death after his conviction of apostasy. He was executed in 1985 at the age of 76. Ms Ibrahim's case first came to the attention of authorities last August when members of her father's family complained that she was born a Muslim but married a Christian man. She insists she was never a Muslim, but was raised as a Christian from the beginning.